Recipes using cranberries as an ingredient. 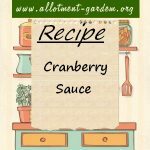 Recipe for Cranberry Sauce. What could be better as a Christmas Gift? It works well with duck, goose or chicken as well as turkey though.